Why would I be writing about a park in Boca Raton anyway? Part of it was that I went up there and had a fairly nice time of it. A pleasant lunch, a bit of a walk under the shade of the walkways, and got off the Island for a change. The other part of it is that it fits in nicely with all this discussion of parking and reworking what Wilton Manors should look like in the Central Business District of the Drive. 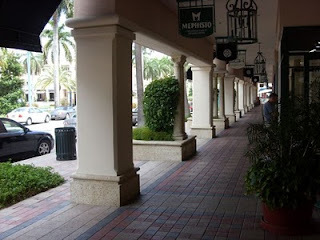 Mizner Park is a large scale New Urbanist Development in Boca Raton. The development includes shops at ground level, some business offices on premises back from the walk ways, apartments and a rather nice Bandshell and Stage at one end anchoring the development. There is a wide park in the middle of the development that separates the two sides and the whole thing was built so you can live work and play in one spot without needing your car. Should you need a car, there are ample free spots to park in a garage that is set off the central area. Its there and you don't really need to see it. The nice thing about it is that this picture is a good illustration of what we should be working towards. The buildings are all built set back from the parking and streets. The set back is covered by an overhanging second floor and this results in a shaded place that you can get away from the South Florida Sun. There are planters on the outside of the walkway along the street to further protect pedestrians from being hit by cars, and the central strip of greenery is chock full of what you'd expect in South Florida, Tall Palm Trees. One block down you can see the Google Street View of the way that Gables built their on street parking and how far back the buildings are set. This development is built by the Gables group. Gables is the group that built Wilton Park on Wilton Drive, one block up from City Hall. These buildings are quality construction, at least outwardly, and they do seem to know what they're doing when you are looking for a development that is mid to upscale in your neighborhood. In short they seem to be a good addition to our City.